엔토 매니저님! LV 선생님은 어떤 분이신가요? Hello everyone! 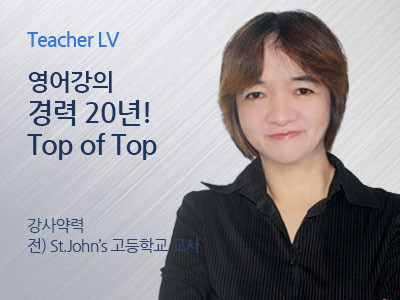 My name is teacher LV. 여러분 안녕하세요! 제 이름은 엘브이입니다. I majored in English and I have been teaching for almost 21 years now. 저는 영어를 전공하였고 영어를 가르친 지는 거의 20년이 되었습니다. I love English as I love teaching. Most of my students are Koreans, some are Taiwanese and others are Japanese too. 저는 가르치는 것 만큼이나 영어를 사랑합니다. 대부분의 저의 학생들은 한국사람들이지만 대만과 일본인들도 있습니다. Though there are culture differences, it is merely solved by the language itself, English. 비록 문화의 차이는 존재 하지만 영어라는 언어 자체로 해소됩니다. I like playing badminton and walking a lot. It makes me healthy and alert. 저는 배드민턴 치기와 걷기를 좋아합니다. 저를 건강하게 해주고 정신을 맑게 해주기 때문이죠. I believe that in order to teach effectively you must be strong enough to battle stress that goes with it. 효과적으로 가르치기 위해서는 스트레스를 견딜만한 강한 체력을 가져야 한다고 저는 생각합니다. As you know, teaching is not that easy so in order to be a great teacher you must not only be full of potential outside but most especially inside. 아시다시피 가르친다는 것은 쉽지 않기 때문에 훌륭한 선생은 외적인 잠재력보다 내적인 잠재력이 특히 중요하다고 생각합니다. Eating a balance diet is the key to maintain a healthy brain, which is the primary necessity in parting knowledge to your students. I see to it that I don't miss breakfast! 균형잡힌 음식 섭취는 학생들에게 지식을 전달하는 데에 매우 중요하며 건강한 뇌의 필수 요소입니다. I enjoy reading documentary books, newspapers, and comic books too. I believe that laughter is the best medicine. 저는 다큐멘터리 책, 신문, 만화책 보는 것을 좋아하고 웃음이 명약이라고 생각하는 사람입니다. Being too serious makes people grow older faster. 항상 심각하게 사는 사람들은 더 빨리늙기 마련이죠. Why not give yourself a time to relax and smile or laugh? I am sure you won't regret it. 자신에게도 잠시 웃으며 쉬어가는 시간을 줘보세요. 절대 후회하지 않을거에요. So dear students all over the world, let us study together, have fun in learning English with me. 전 세계의 수강생님들, 저와 함께 즐겁게 공부해봅시다!